Giovanni's Kitchen is Navigator's Italian-style restaurant. Navigator's original Italian venue was Portofino's, an Italian fine dining venue. Giovanni's is a more casual venue. Originally, the concept was for it to be a family-style restaurant with sharing of dishes. Thankfully, that idea did not take hold and now Giovanni's can be described as a place for a nice night out. The Giobanni's on Navigator is located on the starboard side of Deck 11 in a separate room by the Windjammer buffet restaurant. Its walls are covered in dark paneling, a simple décor. But the most attractive feature of the room is the floor-to-ceiling windows. To begin the meal, I had a serving of the eggplant parmagiana. This dish can be very disappointing when it is not made correctly and so good when it is made correctly. In this case, it was the latter. It was warm from the oven, not over-cooked or under-done. The freshness of the ingredients also stood out. Although not really a mainstay of Italian cuisine, the filet of beef tenderloin is one of my favorite items on the Giovanni's menu. Navigator re-affirmed my liking for this dish with a tender, nicely cooked filet that came to the table just as ordered. A Gorgonzola sauce accompanied it, giving the beef a contrasting bite. After experiencing how nicely Navigator did beef tenderloin in Giovanni's, I had to experience a filet in Navigator's steakhouse, the Chops Grille. 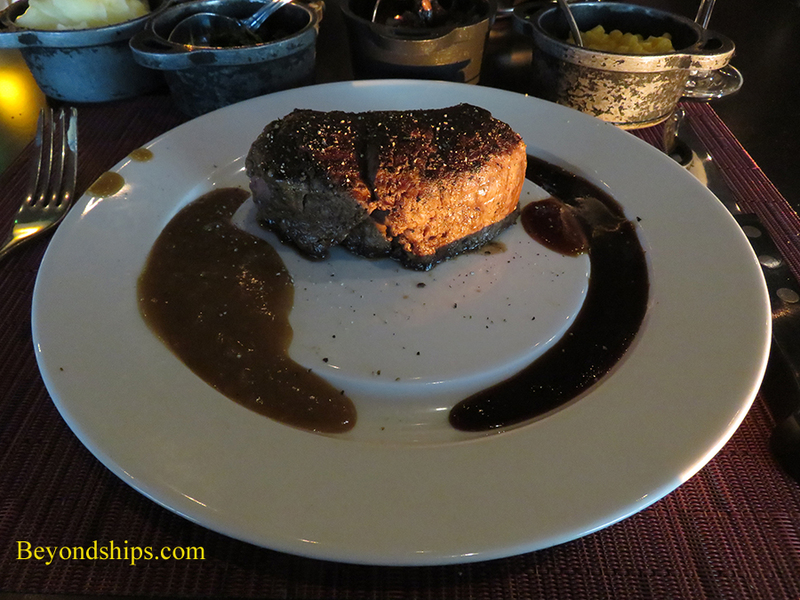 When I sail on a Royal Caribbean ship, I usually have at least one dinner in Chops. This steakhouse venue can be relied upon for a superior meal. Although they differ from ship to ship, the setting is always nice and the service good. Still, prior to coming aboard Navigator, I was beginning to get a little bored with the Chops experience. It was becoming too much of a routine and so I was thinking of letting it go for a few cruises. However, I decided at the last minute to give it another try. I was very glad that I did. The experience reminded me of why I came to like Chops in the first place. The Chops on Navigator is located on the port side of Deck 11 in a separate room that is the mirror image of Govanni's. Like Giobanni's it is dominated by a wall of floor-to-ceiling windows. Since the sun was setting as I entered the restaurant, the windows offered spectacular views of the multi-colored sky and the dark grey blue sea. The greeting at the door was friendly and I was shown to a nice table near the windows. Throughout the meal, the staff was efficient and friendly. Following the tasty forest mushroom soup, I had ­the 9 ounce filet mignon as the main course. It arrived perfectly prepared, cooked just as ordered. The galley for this Chops is next to the dining area with an open window linking the two. As a result, the beef does not have to endure a long journey from kitchen to table. It was fresh and hot. To go with the filet, the waiter brought s tray of sauces. From past experience, the pepercorn sauce and the wine reduction best serve to bring out the flavor of the beef because of the contrast that they provide. However, here they were not really necessary. Chops offers quite a few side dishes to accompany the main course. There is no restriction on how many you can order so you can sample several. They arrive in small bowls and so the quantity is not overwhelming even if you order a few. I found the mashed potatoes and the sauteed spinach the most memorable. For dessert, I ordered the cookies and ice cream. This was good but as this was a cruise from the UK, the cookies were baked to suit British tastes. (Americans tend to favor softer cookies, while the British prefer cookies that are baked to a harder consistency). Still, it was a good dessert. 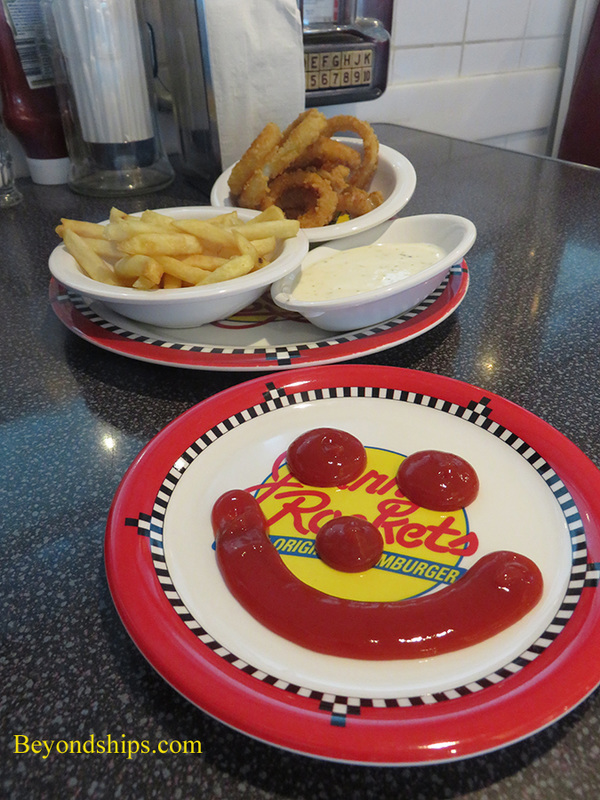 Johnny Rockets is an experience. On Navigator, this restaurant is a separate structure designed both inside and out to recall a 1950s American diner, complete with booths and counter. The waiters are also dressed in period outfits. Popular hits from the last half of the 20th century play over the sound system. Every so often, the waiters form a line and dance in the aisle to one of the hits. This venue is very popular on Navigator. I arrived at Johnny Rockets during the afternoon of a port day and every booth and every stool along the counter was occupied. Consequently, the burger took a long time to arrive at the table. At one time, the burgers offered at Johnny Rockets were indisputably the best burgers at sea. However, since Royal Caribbean pioneered offering the premium burger on its ships, several other lines have opened their own premium, made-to-order burger venues including the Dive In Burgers on Holland America Line and the Guy's Burger Joints on Carnival Cruise Lines. While the Johnny Rockets burger (I had the Rocket Double) is still a very good burger, I can no longer say that they are superior to all other seagoing burgers. The Carnival and Holland America product give the guests more options in designing the burger, both to ingredients and as to how it is cooked. Also, the burger on Navigator did not taste as fresh as rival burgers. In addition to burgers, Johnny Rocket's has milkshakes and sundaes. I had the Oreo Sundae, which is a large glass filled with vanilla ice cream and pieces of Oreo cookies. On top, there is a mound of whipped cream. The burger and the accompanying French fries and onion rings are a lot to eat and more than a few calories but I was very glad that I did not pass on having this delicious sundae. It is not haute cuisine but it is delightful. *As of this writing, Navigator also has Izumi (Asian fusion) and Sabor (Mexican-inspired cuisine).